Okay apologies for accidentally [seriously] deleting the picture thread. So here is the all new, improved [and stickied] picture thread. I like your new pic! You're so cute! I just want to pinch your little cheeks...okay I'll stop now. Ooo, that dome thing is really cool. Something about the way the shadows are falling in that first one almost makes it look like a painting rather than a photo. This is a before, obviously. Visiting with one of my UL friends at the German Christmas market in Chicago. Out for dinner with a few of my best friends for my birthday. Right. So I realize I probably look exactly the same to you lot, but it's a big difference to me! Then again, I have to look at myself in the mirror everyday. . . I should post the one I have of Paddy by that blue wall, too. It's even better. Hi everyone Last week I spent 5 days living and working with the Benedictine monks of St. Andrew's Abbey in Valyermo, California. 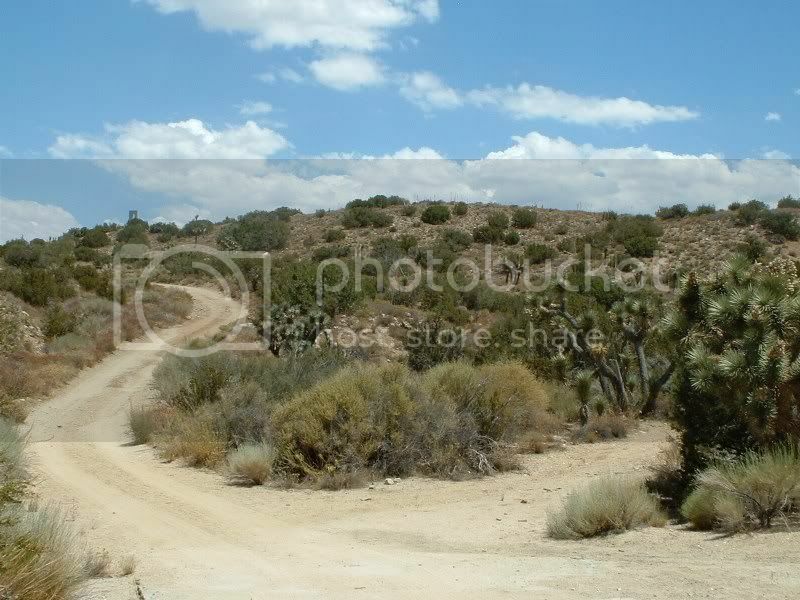 Their monastery is located in the high Mojave desert--just a stone's throw away from the San Andreas fault line. I thought you might like to see a few pictures. Here's a shot of the terrain around the Abbey. While the Abbey grounds, themselves, are lush and green all around them is desert complete with lizards and snakes, sagebrush and Joshua trees. 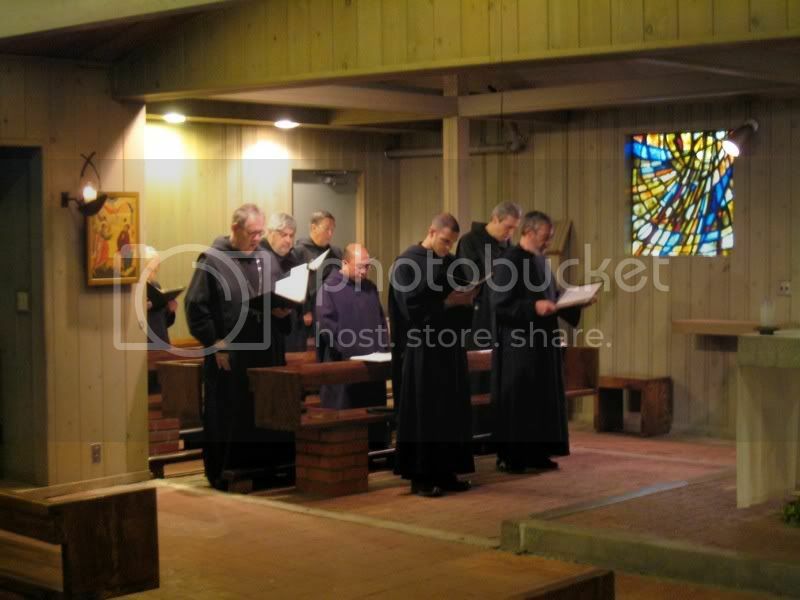 Here is a shot of some of the monks during vigils--that is the first prayer service of the day, at 6:00AM. Part of our class experience was to pray 4 times a day with the monks. We also spent time working with the monks--just doing some basic tasks (like stamping library books or cleaning dishes)--so that we could get a sense of their community life and also ask them any questions (personal or otherwise) in a comfortable, laid-back environment. 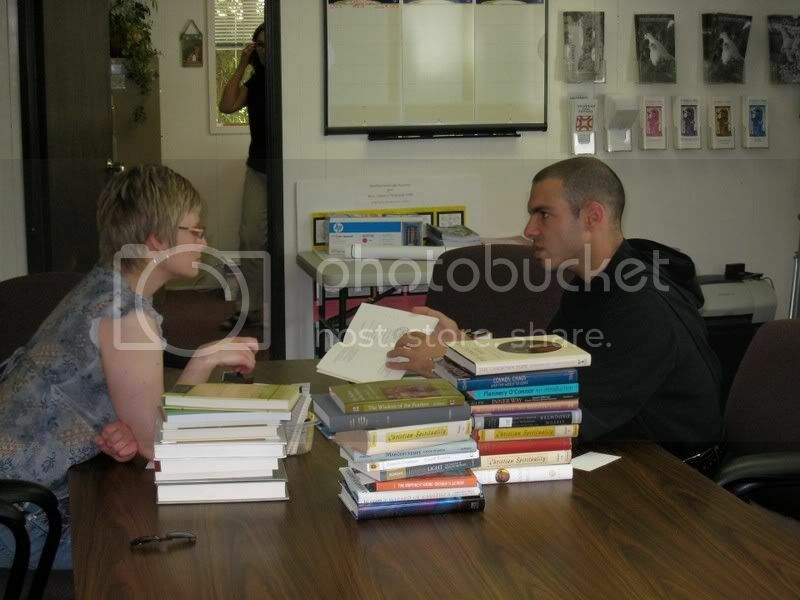 Here I am chatting with one of the two novices, Brother Cassian, as I stamp a few library books. Brother Cassian has only been with the order for 8 months--some of these guys have been monks for over 40 years! Finally, a shot of me and my classmates and our professor, Dr. Carey--he's the one with the beard--standing with some of the monks. On the left is Brother Bede (he's on the end) and Brother Cassian again--they are both novices to the order--and on the other side is the novice director and now the new abbey prior (guy in charge of the abbey until they elect a new abbot), Fr. Damien. I had such a great experience at the Abbey--and the monks are super cool. They are *anything* but uptight (well, the novices are a little stiff, but they are novices after all ) and are some of the most peaceful people I've ever met--even in adversity. From the outside that looks like the most unlikely place for an monastery but thinking about it, Christian monasticism didn't begin in leafy suburbs or plush countryside retreats but in the harsh deserts of Egypt and Syria. Very nice pictures, thanks for sharing them with us. Just a picture I took at a cemetery on Sunday. I just thought i'd share because sometimes I think it's a beautiful picture and at other times it completely creeps me out. That's a great picture! I love the contrast. Beautiful pic! 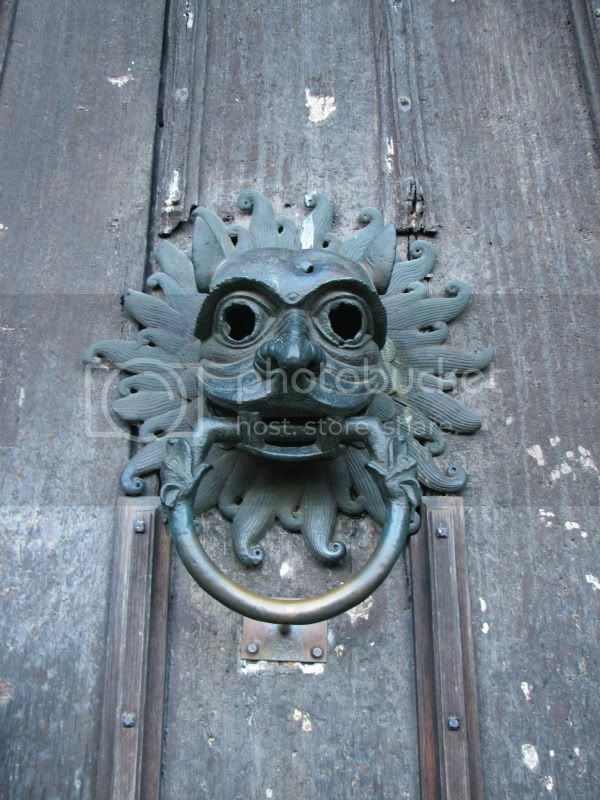 I can see how sometimes it creeps you out, but its got a poetic aspect to it as well. Awww, thanks guys. I really do like it. Of course I had to edit it, but nothing major. Just played with the contrast a bit. It reminds me of The Raven by Poe cause there are always jet black ravens there. Which is why it creeps me out...I have a certain phobia. I tend to photograph trees a lot. This may sound weird but that cemetery is a favourite of my for pictures. I should show you guys the pics I took when I went to Sri Lanka ^_^. Great shots, Saturn! I'd read about the Keats statue (about its unveiling) but I was under the impression it was an indoor sculpture,now I see why I thought that at first--he has his own little lecture room, doesn't he? I wonder if they scaled him to size as he looks so small next to you (all of the 5Ft. he was!). Great sculpture and darn it am I jealous of your trip to London! *Sigh* Someday, when the dollar isn't tanking, I might be able to wrap my arm around Keats, too. . . I too had the impression that the sculpture was indoors, but in fact it is in a courtyard on a little patch of grass surrounded by flowers, quite a nice location in an old part of the hospital [turn right at the Nat West ATM machine if you enter from the London Bridge rail station entrance for anyone hoping to go there]. "Sure a poet is a sage, a humanist, physician to all men". Also it states "John Keats 1795-1821", and "Apothecary, Guy's Hospital 1816"
I would have stayed and had a little bit of contemplation, and perhaps even poesy writing were it not for the heavy pouring rain in London that day. Well worth a visit though, it was eerie sitting beside this representation of him, seeing [as you've rightly pointed out Malia] how small he actually was. I'm not very tall [5"9] but even I tower over the lowly Keats and it put a whole new perspective on my understanding of his insecurity about his height.